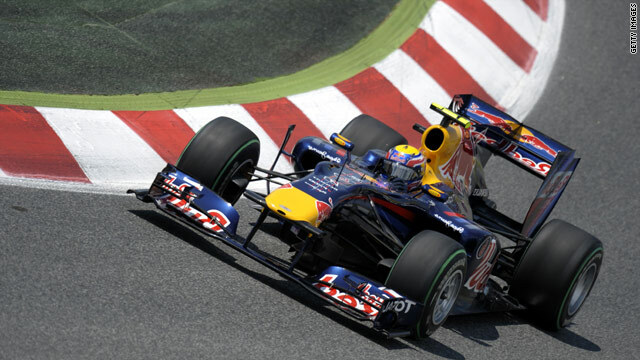 Mark Webber drives his super-quick Red Bull to the front of the grid in Spain. (CNN) -- Mark Webber clinched pole position in the final qualifying session at Barcelona's Circuit de Catalunya, to complete a dominant performance from a Red Bull team that showed blistering pace ahead of Sunday's Spanish Grand Prix. The Australian put his car at the front of the grid with a time of 1:19.995 seconds, before German teammate Sebastien Vettel came in second fastest to deliver a one-two for the Austrian-based team. It means Red Bull, who currently sit in third place in the constructors' championship, have claimed pole position in all five races of the 2010 season. The grid also bodes well for Webber, who is still in search of his first victory of the current campaign, as 12 of the last 13 winners at the circuit have started from pole. Britain's Lewis Hamilton finished nearly a second behind Vettel in third, while McLaren teammate and compatriot Jenson Button will start from fifth place on the grid after the Ferrari of Fernando Alonso clinched fourth. Meanwhile, German legend and seven-time world champion Michael Schumacher drove his recently lengthened Mercedes to sixth ahead of Robert Kubica's Renault. After the qualifying session Webber said his second pole of the season was a reward for hard work by the Red Bull team. "This pole is for the team. The guys ... both sides of the garage have had about five hours sleep in the last two nights, they've worked incredibly hard. It goes to show the effort they have put into [improving] the cars is now translating into lap times. "It's a sensational qualifying for both Seb and myself. [Team boss] Christian [Horner] said to me before qualifying, you probably won't get to drive a car this quick around here again, so go and enjoy yourself and I did, and that was a sensational qualifying session," the 33-year-old told reporters. Vettel remained confident that he could overturn the odds by beating his teammate come the race, but said there was a long way to go before claiming the points. "It will be a long race, at the moment it looks comfortable but we know how quickly things can change. It will be a tough one and maybe there will be some rain -- but I think starting first and second is a good result." Hamilton said he had been surprised with how much the Red Bull cars had improved their overall speed since the last race in Shanghai, China. "I don't think anyone expected the Red Bulls to be as fast this weekend. But we will continue to push and focus on the areas we know where we are weakest to try and close the gap. So we'll see how the start goes tomorrow," he told reporters. Alonso, who will drive in front of his home crowd, qualified five places ahead of teammate Felipe Massa of Brazil but conceded that it would prove tough to beat the Red Bull team. "If you are two or three tenths behind you maybe can fight for victory, but if you are a second behind you can only expect to be not too far away. In normal conditions Red Bull is favorite," he told gathered media.